‘These paintings are about one tree. A cherry tree in a garden that may have been part of an orchard before the nearby house was built. One large bough was deteriorating and should have been removed. Instead, we decided to support it with stakes’. What to read into the apparent simplicity of Kossoff’s statement? This ‘tree’ is as much an idea as a reality. It is less the particulars that matter than the nature of his engagement with it (what John Berger calls his ‘collaboration with the painted’). By painting it he records his visual and physical engagement with a specific object over time, just as Morandi did with his studio bottles or Cezanne with his views of Mont St. Victoire. For the six years between 2002 and 2008 he returns again and again, in paint and charcoal, to this tree and the crutches that support it. Like his friends it sits silently and patiently for the artist. It does not change much, only imperceptibly according to the change of light from one day, one season, to another. Mostly the light is grey, as characteristic of London as the red brick, the scrubby ground and train line that lie between and beyond the tree’s brown branches: the nondescript, mundane, familiar territory at the city’s margin. All these elements repeat themselves in the same mute and pallid colours, the same structure and format, in each of the nine tree paintings on show. And yet, what appears fixed and static is also what gives them their cumulative solidity. The earthy pigments he uses are drawn from the ground (or from willow sticks in the drawings). The motif, a wooden bough supported by wooden stakes, emerges from the unframed wooden panel on which it is realized. It holds the tree’s weight as the panel holds the paint’s weight. The stakes lean against the leaning bough, visually and physically balancing its diagonal thrust across an expanse of shapeless ground and sky. Tree and pigment coalesce, just as painter and painting coalesce. Once it was part of an orchard, now it is alone and dying. He observes this as he observes his old age, slowly and unremittingly. 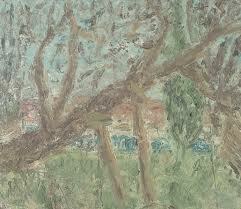 The orchard of his youth has gone, just as the painters inspired by Bomberg in the post war years have gone. Only he and Auerbach (the two unyielding stakes) remain to support the decaying body of a painterly language that now appears remote in time, and superseded by new media. Nevertheless, as Berger wrote: ‘You have saved much of what you love’. The tree is the answer to what he paints and why he paints: an intense looking destined to pass with the looker himself.